When a world you barely dreamed existed is not only real but a part of your destiny, would you take the path unfolding before you? And how far will you go to protect those you Love?.. 17-year-old Raine Cooper has enough on her plate dealing with her father’s disappearance, her mother’s erratic behavior and the possibility of her boyfriend relocating. The last thing she needs is Torin St. James—a mysterious new neighbor with a wicked smile and uncanny way of reading her. 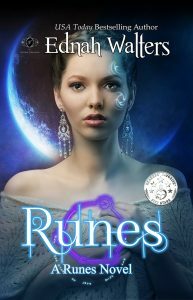 Her award-winning YA Paranormal Romance—Runes Series—started with Runes and has a total of 9 books to date. Heroes, released in March 2016 and Gods, released in June of 2016. Her last book in Raine & Torin’s story, Witches, was a Readers’ Favorite Awards winner. Ednah also writes Contemporary Romance as E.B. Walters. Her contemporary works includes The Fitzgerald Family series, which has six books, and her USA Today bestselling series: Infinitus Billionaires. The first book Impulse is a 2015 IndieFab Silver Award winner in contemporary romance category and 2015 National Indie Excellence Award winner. The next book in the series, Intrigue (Infinitus Billionaire, Book 3) Roderick Thorne’s story, is scheduled to be released Aug 2016. She has 6 more books planned in this series. Whether she’s writing about Valkyries, Norns, and Grimnirs, or Guardians, Demons, and Archangels, or even contemporary Irish family in the west coast, love, family, and friendship play crucial roles in all her books.